To Cite: Soliman A M S, Abdel Rahman M, Makram F. Redo in Bariatric Surgery for Non Bariatric Indications; Laparoscopic Management of Gastric Volvulus With Hiatal Hernia Two Years After Laparoscopic Sleeve Gastrectomy, J Minim Invasive Surg Sci. 2014 ; 3(3):e17294. Introduction: The popularity of Sleeve Gastrectomy, as a treatment for morbid obesity, has increased recently due to its safety and relatively technical simplicity. Sleeve gastrectomy, however, is not free of complications and due to the increased number of cases performed with this method, new postoperative complications would be expected to be experienced. Few cases of gastric volvulus are reported until the day. The reasons for volvulus are laxity of the gastric anatomical fixations, incorrect position of the stomach, rotation or improper dissection of the back of stomach. Case Presentations: The purpose of this case study is to report a patient with morbid obesity with no remarkable medical history, who underwent laparoscopic sleeve gastrectomy with body mass index (BMI) 42 kg/m2 two years ago. His BMI was 23 kg/m2 when he referred to us. The patient showed symptoms of vomiting, abdominal pain and fullness in the postoperative period and along the two years after sleeve gastrectomy, presented with repetitive attacks of vomiting and dysphagia to solids, which suggested upper gastrointestinal occlusion and gastric volvulus of the gastric sleeve accompanied by herniated proximal sleeved stomach in the hiatus which was proved later by further investigations. 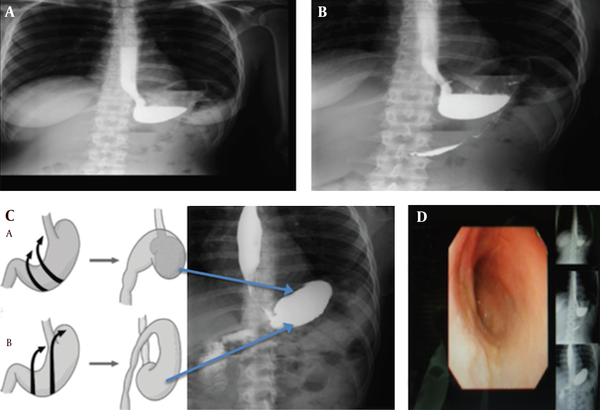 Follow-up investigations included barium swallow and upper gastro-intestinal tract endoscopy showed associated hiatus hernia and no obstruction, but revealed twisting of the mid-stomach with intractable reflux symptoms and obstruction was partially and temporarily corrected by endoscopy. We performed a laparoscopic dissection and made the related adhesions of the gastric sleeve and omental attachments on the back of the stomach free and then repaired the hiatal hernia with anterior fundoplication. Conclusions: Sleeve gastrectomy leaves the stomach with no fixations along the entire greater curvature which may altogether precipitate the patients to sleeve volvulus accompanied by inadequate dissection of the back of stomach. This complication is a rare finding and reported in few cases till this date, especially when associated with hiatal hernia. So, we discuss the precipitating factors and how to avoid and manage this complication and its related morbidities. Laparoscopic sleeve gastrectomy (LSG) is proved to be a safe method with excellent outcomes and low complication rates for morbidly obese patients (1). It is however not free of complications (1). The most frequent complications include leakage, hemorrhage, splenic injury, sleeve stenosis, and gastro-esophageal reflux (2). Gastric volvulus involves the rotation of all or part of the stomach around the anatomic axes and can lead to necrosis and perforation (3). Lax gastric fixation, incorrect position of the stomach, rotation or improper dissection of the back of stomach can altogether lead to volvulus, which may be organo-axial (in which the pylorus and gastro-esophageal junction define the axis of rotation) or mesenteric-axial (in which the mesentery marks the transverse axis of volvulus) (4). Most cases of gastric volvulus are organo-axial. Heartburn and Gastro-esophageal reflux disease (GERD) symptoms are common in obese patients, which may be a pre-existing problem attributed to a raised intra-abdominal pressure and concurrent presence of a hiatus hernia (4) (Figure 1). Hiatal hernia after SG can be due to two reasons: an association at the primary surgery which has not been corrected creates a high-pressure system that can make GERD unbearable for patients and make lower esophageal sphincters incompetent. Or secondary to a mixed volvulus mechanism (organo-axial and partially mesenteric-axial) which may precipitate the patient to a proximal gastric (fundal) dilatation, which is on the long run (5). A 28-years-old smoker female with asthenia and a BMI of 23 kg/m2, referred to us from another hospital. She had underwent laparoscopic sleeve gastrectomy two years ago (His BMI before sleeve was 42 kg/m2). His had symptoms of vomiting, abdominal pain and fullness along the two years following the sleeve gastrectomy, presented with repetitive attacks of vomiting and dysphagia to solids, suggesting upper gastrointestinal occlusion and gastric volvulus of the gastric sleeve accompanied by herniated proximal sleeved stomach in the hiatus which was proved later by further investigations. We started our investigations by barium swallow, which showed no flow of contrast, Then a leakage of dye was seen passing to the duodenum (Figure 2. A, B, C). The upper gastro-intestinal tract (UGIT) endoscopy showed associated hiatal hernia and no other obstruction rather than twisting of the mid-stomach with aggravated reflux signs. But patient showed partial improvement days after untwist by endoscopy; then returned to repetitive attacks of vomiting (Figure 2. D). Because of the patient’s persistent inability to eat, the patient was taken to the operative room for diagnostic and exploratory laparoscopy. We found that gastric sleeve had volvulated around the mesenteric and longitudinal axis. 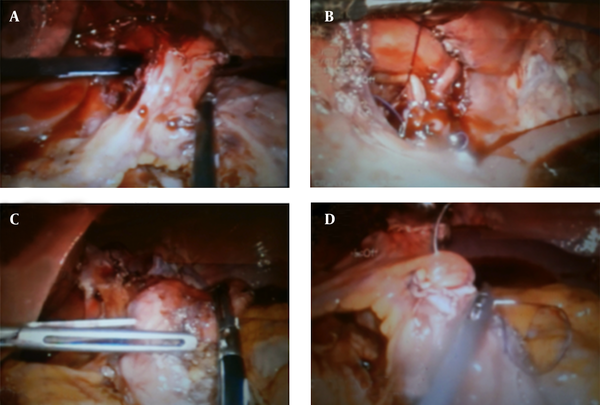 Extensive adhesions of the sleeve stomach body with the liver and dilated proximal stomach were also observed. We started by making these adhesions free using the ligature (Covedian, Electrodiathermy), and then the adhesions of the diaphragm, till we visualized and identified the proximal part and distal part of the sleeved stomach. We tried passage of the bougie, which stopped at the proximal part suggestive of kink or twist at that place along with findings of UGIT endoscopy (Figure 3. A, B). Then we dissected the adhesions between the sleeve body and transverse colon. Omental adhesions were also on the back of stomach, which seemed to be not properly dissected. Adhesions of the colon were along all the sleeve body. The proximal part of stomach was also dilated posteriorly. Adhesions were dissected to be able to reach the left crus of diaphragm and release the herniated part of sleeve dissection going anteriorly and to visualize the left and right crus of diaphragm. Now bougie could be passed to the sleeve body with no more kink (Figure 3. C, D). Then we repaired the hiatal hernia and released the sagging part of proximal sleeve and the distal esophagus to be withdrawn in the abdomen, till we have sufficient length of esophagus and we started suture repairing of the crura for closing the defect in the hiatus (Figure 4. A, B). Then we made two sutures for anterior fundoplication (Figure 4. C, D). Fixation of the sleeve body was applied at the level of incisura by two sutures to omentum. 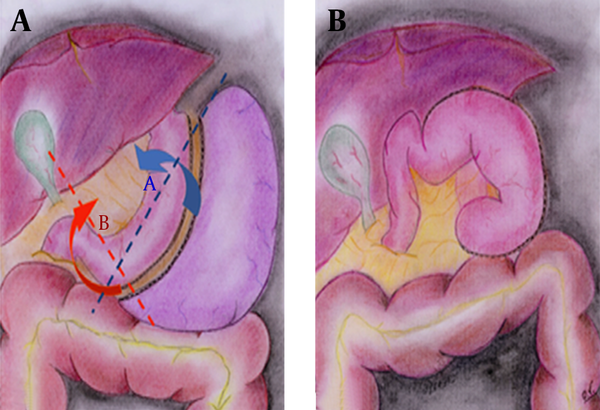 Now, bougie could be passed easy to the distal stomach (Figure 5. A, B). Leak test was done through the gastric caliber tube, leaving a drain (Figure 5. C, D). Surgical time was 130 minutes. She subsequently progressed to use clear liquids and then to a full liquid diet and gradually to regular diet. The patient is now 10 months post-procedure and gained weight, with BMI of 28 kg/m2 and enjoys a good quality of life. The sleeve gastrectomy has been adopted by many surgeons due to its excellent weight loss and simplicity of the procedure. Though simple, it has been noticed that when complications occur, their management may be complex and require endo-luminal and surgical interventions (1). These complications include leakage along the staple line or gastric fistula (2). Some cases have also been reported late onset stenosis at the level of the incisura angularis(1, 2). However due to the increased number of cases performed new postoperative complications would be expected to be experienced. Under normal anatomic conditions, the stomach is fixed in place by four ‘‘ligaments’’: gastrohepatic, gastrosplenic, gastrocolic and gastrophrenic. Laxity of these ligaments, the absence of omentum, para-esophageal hernias, or diaphragmatic eventrations increase the mobility and ability of the stomach to rotate organo-axially or mesentero-axially (4). Sleeve gastrectomy leaves the stomach with no fixations along the entire greater curvature, which may predispose the patients to volvulus. This possibility may be especially true when patients have lost weight and this laxity may then increase in the whole length of sleeved stomach (5, 6). 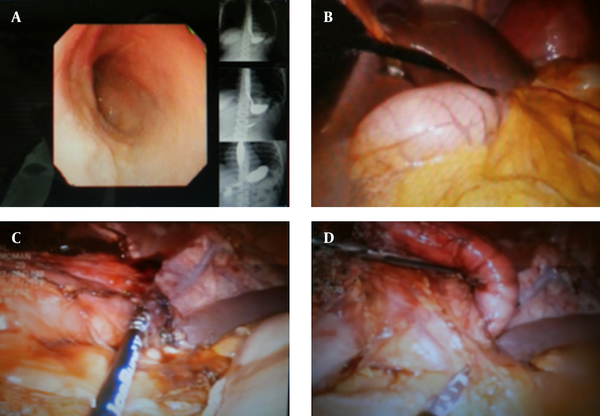 We presented here a case of gastric sleeve torsion as a rare complication after sleeve gastrectomy, especially when presented after a primary operationtwo years before. We also present the way to correct the precipitating factors of volvulus rather than to convert it to gastric bypass. In our case, the volvulus occurred at the mid stomach at the level of incisura, which commonly happens due to the curve and angulation of long sleeve stomach. Also, there was herniation at the upper part and sagging of proximal sleeve, which also precipitated the twist of stomach. Another factor was the improper dissection of adhesions on the back of stomach (omental adhesions with the pancreas especially at the level of incisura). All these can lead to a shift in the organo-axial direction, followed by a mesenteric-axial rotation in part that lifts and rotates medially the distal part of sleeve because of laxity and mobility (Figure 1). To date, only one case has been reported with gastric volvulus after sleeve gastrectomy (6). Therefore, we recommend the treatment to be according to the patient’s clinical status, such as in our case who had a long history of vomiting and athenia after the first LSG and low BMI 23 kg/m2. This was an important reason to correct the precipitating factors, such as improper dissection, hiatal hernia and fixation of the tabularized stomach to prevent any other torsion or rotation caused by a lack of fixation rather than to convert it to another malabsorptive bariatric procedure (7). 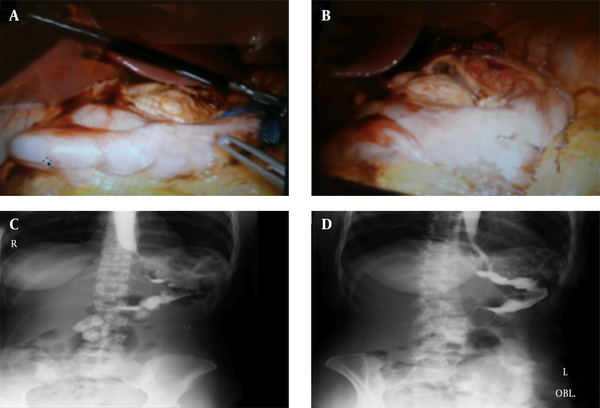 This was an important reason to correct the precipitating factors, such as improper dissection, hiatal hernia and fixation of the tabularized stomach to prevent any other torsion or rotation caused by a lack of fixation rather than to convert it to another malabsorptive bariatric procedure. We would like to thank the general and minimally invasive surgery head department for his support and the hospital administrator for patients’ care and help in the study. Authors’ Contributions: Dr. Ayman M. Shaker Soliman developed the original idea and the protocol, abstracted and analyzed the data, wrote the manuscript, and is the guarantor. Dr. Mohamad Abdel Rahman and Dr. Fady Makram contributed to the development of the protocol, abstracted the data, and prepared the manuscript. Financial Disclosure: Dr. Ayman Soliman reports receiving research grants and consulting fees for speaking from Covedian. Funding/Support: This study was supported in part by IFSO and presented in IFSO congress 2013 Istanbul after revision.